Try and get yourself into a routine - early nights mean early starts, go to bed early (around 10pm) and get up early (around 7am). Set an alarm clock and put it on the other side of the room so that when it goes off you have to get out of bed to turn it off. Once you have turned your morning alarm clock off, do not get back into bed! Stretch and open your curtains/blinds to set the light into your room. Seeing the light of a morning will send a message to your brain to say "it's morning, time to be awake". Making your bed of a morning is one of the most important things. Once your bed is made, you don't want to get back into it. I don't really need to tell you all that having a shower of a morning is the best way to wake yourself up. The amazing people at The Body Shop have brought out the most amazing little eye cream stick to held you wake up of a morning - it's called "Eye Cube". It's a refreshing anti-fatigue eye stick with protective vitamin E and wheatgerm oil. It's gentle, easy-glide application that moisturises, cools and instantly revives the appearance of tired eyes. IT IS AMAZING! I've been using this for over a year now and I love it so much. It is perfect for waking up tired eyes of a morning. Tip: use this along side The Body Shop's Vitamin E Eye Cream for extra eye care. Making time to have five - ten minutes of quiet time of a morning with a to-do list really changed my whole attitude for a morning. Keep a to-do list in your bullet journal, diary or just a note book - to-do lists really help! Try and write down all of your to-do's for the morning, the night before as it will also help you sleep better getting all the madness of the morning out of your head before bedtime. Make a Morning Music playlist on your phone, iPod or spotify. Put some of your favourite music on there, and whilst getting ready for the day have a little dance about. Dancing not only will make you happy and put a smile on your face but it's a great way to do some light exercise and it will also get your blood flowing. Have a coffee to wake yourself up if you want to, but make sure you have some water to balance out the caffeine too. 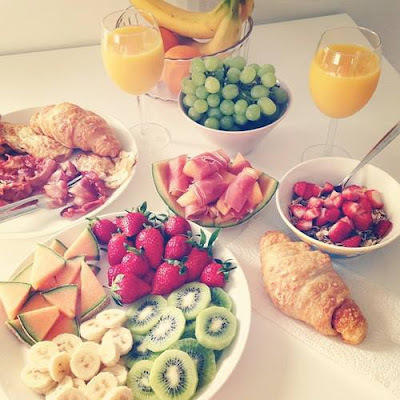 Also having a healthy breakfast of a morning is such a wonderful, healthy and perfect thing to do - have some fruit, pancakes, cereal or a bagel/toast. What a cute little post! Also I've heard great things about that Body Shop eye cream, glad you like it too, might have to check it out!! Lovely post, I'm not a coffee drinker but I agree with everything else here! I think not many people have a nice little routine in the mornings and just stumble out of bed and rush to school/work, but I have found that waking up just that little bit earlier (after getting enough sleep) to take the times to really enjoy aspects of the morning makes a huge difference in how I take on the day! I should stretch more in the mornings. I'm definitely a hit snoozer! I should take on board some of these points, I definitely keep hitting snooze in the mornings!